The village of Yarrow is situated on Yarrow Water, 9 miles (14 km) west of Selkirk, in the old county of Selkirkshire. Its original church was built c.1640 by the Covenanters and restored after a fire in 1922. Sir Walter Scott attended church here while he lived at Ashiestiel (1804-12). 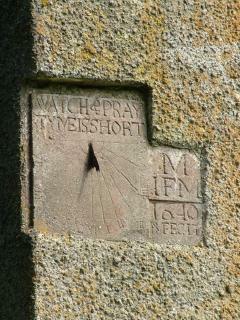 A sundial contains the instruction 'Watch and Pray / Tyme is Short'. An early Christian stone lies about 1 km southwest of the village with a faint Latin inscription which possibly names members of a British Christian dynasty in the 5th or 6th Century AD. Well known for its battles, feuds and beauty, the Yarrow Valley spurred the creation of numerous ballads, such as 'The Dowie Dens of Yarrow', and figured highly in Sir Walter Scott's collection of Minstrelsy. Other authors associated with the area include William Dunbar, James Hogg, Christopher North and Wordsworth.